# | | +- nd_lit: "str"
• 4 numbers are needed to represent “begin” and “end”. • "Code position" is a pair of lineno and column. • Ruby holds *only* line numbers until Ruby 2.4. 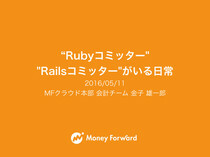 • Ruby holds line numbers and columns since Ruby 2.5. • Today’s main topic is “Column”. • Vary according to programming languages and editors. 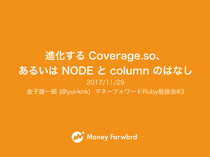 • For branch coverage and method coverage (Ruby 2.5~). • You may forget to write test codes for `then` cases. • `n`: How many times the “then clause” is executed. • `m`: How many times the “else clause” is executed. YOU SHOULD WRITE TEST !!! • One line can contain one or more branches. executed by only line numbers. obj&.foo? ? "a" : "b"
| | |+--- '\n' / "end-of-input"
• Analyzes tokens conforming to the rules of Ruby syntax. • Builds AST in actions. • $1 stands for the value of the 1st component (`arg`). 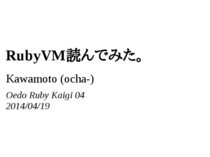 • "Ruby Under a Microscope" / “Rubyのしくみ"
• To pass code locations to compile phase. • To store code locations on ISeq. • Embed code locations into each NODE. 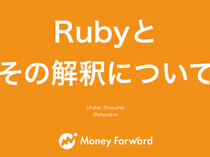 • Original source of location information is Ruby script. should implement location information in "n-1"th step. • It has struct for lexer (`lex`). • Lexer processes input in units of lines. • *Basically* processes from top to bottom. • When token '+' is recognized (Left). • When token tINTEGER (2) is recognized (Right). • `lex.ptok - lex.pbeg` (begin) and `lex.pcur - lex.pbeg` (end). • Copy location information to `YYLTYPE *yylloc` in `yylex`. • The `yylloc` argument is newly added to `yylex`. • Call `RUBY_SET_YYLLOC` to set `yylloc`. • Now we can use `@n` in each action. • Assign right hand side. right hand side is assigned. • `NODE_ITER` (method call with block). • `NODE_ITER` is added to `NODE_CALL`. @nobu is the lord of Demon Castle "parse.y". • Define some rules and check all ruby files in "test"
• `lineno` is initialized with `0` and `column` with `-1`. • Validate all node locations are update at least once. • Validate children do not exceed a parent location. • Give `NoMethodError` more detailed message. 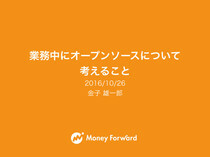 • We discussed this topic at Developers Meeting yesterday. • We can get children nodes. • We can get location information. • AST Node has location information. • Share the future plan of code locations feature. • Add unique id (per file), “node_id”, to Node. • Store node_id of insn on an ISeq. • We can distinguish between `#foo`s by node_id. • Exceptions have an ISeq and a program counter (pc). • Get node_id from an exception. • Parse the source code file and find Node by node_id. • Get location of Node. • Build an error message.